Territory tourism operators and businesses are launching a “gasfield-free” campaign in Katherine, according to a news release from them today. They say they wish to “highlight the risks fracking gasfields will have on our vital tourism sector and the iconic regions people love to visit”. A series of postcards showing icons under threat are being launched to coincide with the start of the tourist season. Local tourism operators and businesses will be displaying the postcards in stores and on tour, says the release. “Our brand image as an unspoilt destination with clean flowing waterways underpins the strong growth of our industry,” says Petrena Ariston, owner of Top Didj Cultural Tours in Katherine. 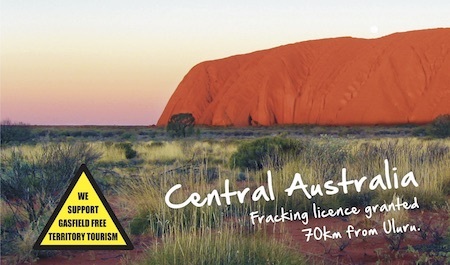 “Right now our national parks, waterways, fishing and tourism icons like Uluru, the Mataranka Hot Springs and Roper River are largely surrounded by permits for fracking gasfields. Reg Ramsden, of Remote Educational Tours servicing Watarrka (Kings Canyon) and Uluru says: “Fracking is not compatible with Territory tourism where visitors come to see a pristine environment. Rob Woods, owner of Ethical Adventures, says: “Fracking will upset the delicate balance of our hydrology, affecting our hot springs, water holes and recreational fishing. It will impact the biodiversity and abundance of our wildlife.